I strongly recommend this paper (no math, some jargon) to those of you interested in monetary policy. Brett Fawley and Christopher Neely walk the reader through the "quantitative easing" programs of the Big Four central banks (Fed, BoE, BoJ, ECB), from 2008 through 2012. 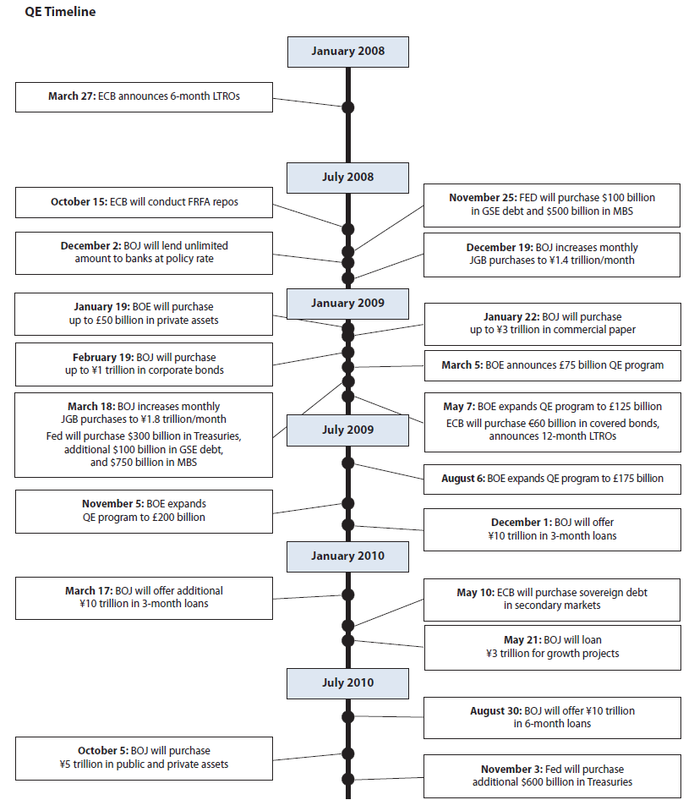 Aside from the month-by-month, bank-by-bank chronicle, this paper provides great charts, tables, and links to the sources. For a wider cross-section of central banks that have doubled the monetary base, dating back to the early 1990s, see Anderson, Gascon, and Liu (2010). 1) There's a difference, at least in appearance, between "quantitative easing" and "credit easing." QE has as explicit target to expand, in a pronounced and persistent way, the liabilities of the central bank (i.e. the monetary base, or M0). QE can take the form of asset purchases or lending programs. Credit easing, on the other hand, intends to improve liquidity or the cost of credit, perhaps in specific credit markets. Credit easing may lead to an enlarged balance sheet, and that's often the case, but credit easing does not target an expansion of the monetary base. 2) Only some of the BoJ's and the BoE's programs can be properly described as QE policies, because they explicitly stated the goal to enlarge the central bank's liabilities. The Fed and the ECB have not formally engaged in QE. In practice, however, just looking at balance sheets, it's difficult to tell un-sterilized credit easing from QE. Fawley and Neely seem to lean towards considering that any policy that increases the monetary base substantially and for a long period is QE, whether as a stated goal or de facto. 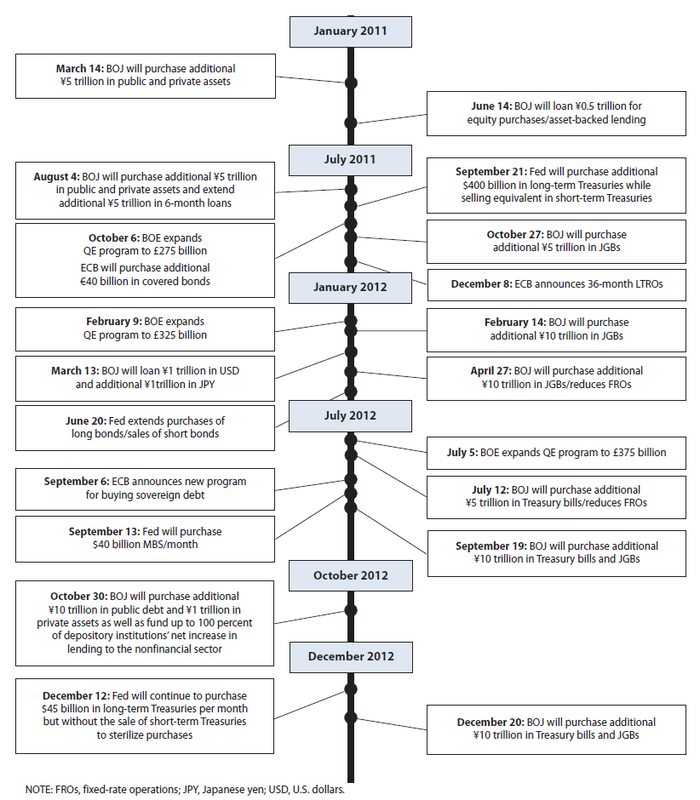 3) An exhaustive list of references to the QE and credit easing programs implemented by those four banks through 2012.